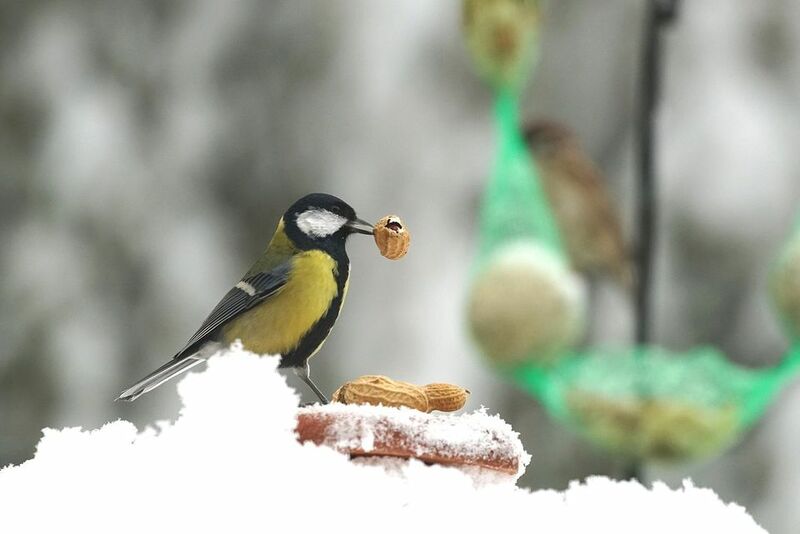 Feeding the birds in winter can be a rewarding way to enjoy birding in your backyard when the weather outside is less than ideal. If you offer the best winter bird foods, you will find a greater variety of birds visiting your feeders even on the coldest days. While you want to be sure to offer the foods that your specific backyard birds like best, these top foods are excellent choices for many common winter birds. All of these foods offer great nutrition, and their high caloric content will give birds plenty of energy to build fat reserves for frigid winter nights. Black oil sunflower seeds are by far the best food to offer birds in any season. 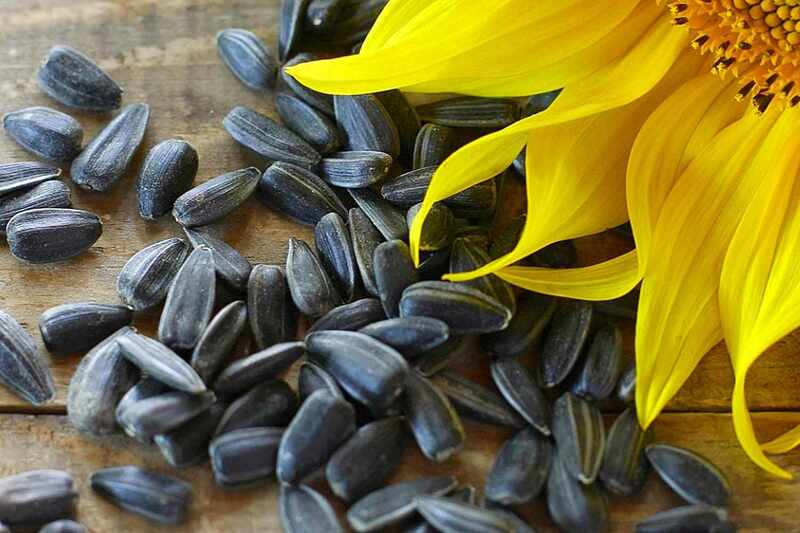 These seeds have slightly thinner shells and higher oil content than other types of sunflower seeds, making them more efficient and nutritious food. They will attract a wide range of hungry birds and can be offered in platform, tube or hopper feeders as well as sprinkled on the ground or a table or railing. If you offer hulled sunflower hearts or chips to avoid a buildup of discarded shells that will get buried under snowfall and can damage new grass in the spring. For high calories, suet is one of the best foods to offer birds. While many birders prefer to avoid suet because it will melt in warmer weather, it is superb winter food. It is also available in many blends with different ingredients to tempt different species of birds. It is even easy to make your custom suet flavors specialized for your backyard flock. You can try different suet shapes for more feeding fun, including balls, bells, and wreaths. In addition to suet cakes, chop suet into chunks or shred it so more birds will sample it. Offer small pieces in dishes or tray feeders to give birds easier access. Peanuts are a high calorie, fat-rich nut that appeals to many backyard birds, including jays, titmice, nuthatches, and chickadees. Because the nuts don’t freeze, they are perfect for winter feeding, whether you offer whole or shelled peanuts. Peanuts are also popular to mix in suet for winter feed. Do not, however, offer birds flavored peanuts or any peanuts with candy or chocolate coatings. Peanut butter is a great feeding option as well and can be smeared on bark or offered in small dishes or open trays. Both crunchy and smooth butter will be hit with birds. Nyjer (sometimes spelled nyger or niger) or thistle seed is a favorite food of winter finches such as pine siskins and common redpolls. This is another oily seed that offers a lot of calories, helping birds store the fat they need to keep warm through the season. Though expensive, Nyjer is readily available and is typically treated so as not to germinate if spilled on the ground, but the hulls can get messy underneath feeders. Offer nyjer in a mesh or sock feeder that can accommodate many birds, but keep it covered with a wide upper baffle to keep the seed dry and minimize mildew. While a lot of birds that eat fruit will migrate in the winter, many other birds that stay in snowy areas year-round will enjoy the treat. Offer chopped apples, orange wedges, banana slices, halved grapes and melon rinds on platform feeders, spikes or nailed to trees. Chopped or dried fruit can also be added to suet mixtures, or you might try a garland strung with cranberries or other fruit for a festive feeder. Plant fruit trees and berry bushes for birds and leave the fruit on the bare branches to give birds a natural food source they can rely on in the winter. White proso millet is a favorite food of many small ground-feeding birds, particularly dark-eyed juncos and other types of sparrows, as well as many doves. This starchy grain is inexpensive and can be easily offered in hopper, tube or platform feeders, and sprinkling it on the ground will attract even more small birds. Millet is often a large component of many different birdseed mixes. To make millet more attractive, mix it with black oil sunflower seeds at first. Gradually change the mix proportions until birds are used to straight millet. Many birds crave salt as an essential mineral, particularly in the winter when roads are regularly salted. Unfortunately, feeding on the side of the road can be deadly for birds, and offering salt crystals at your feeders will help keep them safe. Create a strong saltwater solution and let it evaporate in a shallow dish to make larger crystals, or pour it over a log or stump if there is no danger of freezing. Salt can kill grass and make it difficult to grow plants, so keep the salt you’re offering the birds well away from gardens and other plantings. To keep birds healthy, only offer salt in minimal amounts. For convenient and economical winter feeding, nothing beats a good quality birdseed mix. Choose a mix that features large proportions of sunflower seeds and millet, but avoid mixes with large amounts of unappetizing fillers such as wheat, milo, and corn. Better mixes may also include nuts and nut pieces birds will enjoy. You may also want to try different mixes to attract different types of birds. Buy individual types of birdseed in bulk and mix your blends to customize them for your backyard flocks. Keep a supply of your personal blend on hand for conveniently refilling bird feeders.